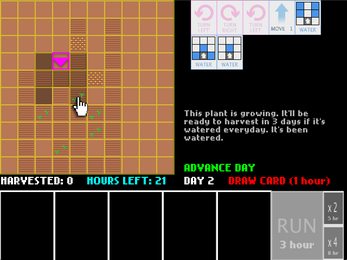 Gardener is a game about programming a robot to grow as many crops as possible in 30 days. To program the robot, you use cards that represent different actions, such as tilling the soil or moving the robot forward. Each day you'll start with seven cards in your hand. Clicking on a card will add it to the program at the bottom. 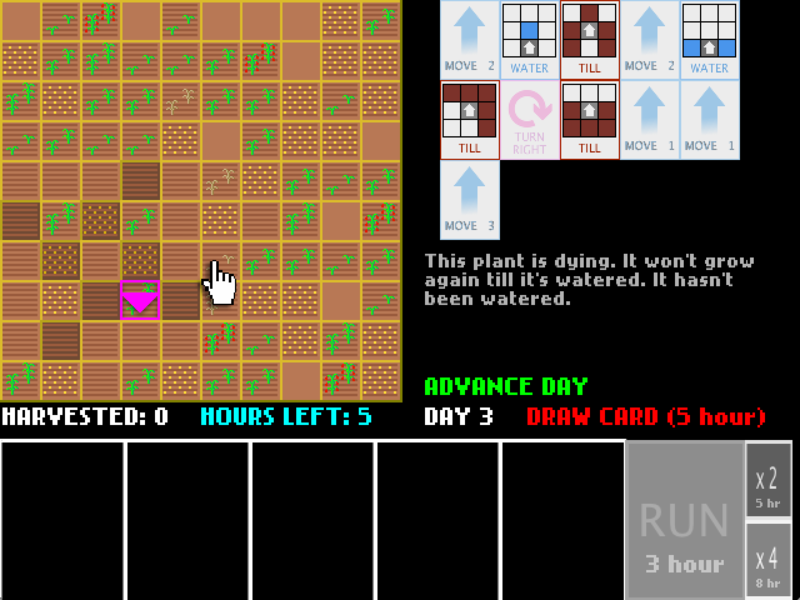 Once there are five cards in the program, press "Run" and the robot will perform the actions on the cards in the order they're placed in the program. 🌱 Actions like running programs and drawing cards cost time. Each day you'll have 24 hours to spend, so use them wisely! 🌱 At the start of each day, you can spend an hour to replace the cards in your hand with new ones by clicking "Replace Cards". You can also draw new cards at anytime by clicking "Draw Card", but each card you draw will cost twice as many hours as the last. 🌱 You can run the same program multiple times using the "x2" and "x4" buttons to the right of the "Run" button. 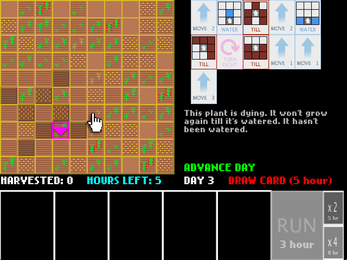 This is more time efficient than running a program once, and is a key to high-level Gardener play! 🌱 As you add cards to the program, you can see a preview of their effects on the field. Try hovering the mouse over the "x2" and "x4" buttons to see a preview of running the program multiple times! 🌱 Be careful when you till! It will destroy anything that's planted already. 🌱 Before you replace cards at the start of the day, you can save ones you'd like to keep by adding them to the program. NOTE: This game isn't meant to be played in one play session! Your progress is automatically saved at the end of every day, so take your time and play at your own pace.